AmTab offers world-class American tables that are versatile and built to last. With budget-friendly pricing and a name you can trust, AmTab tables are an excellent choice for any office, school or house of worship. 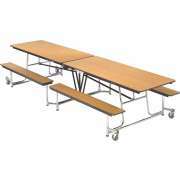 All folding tables, cafeteria tables and banquet tables have an attractive appearance and user-friendly design. Hertz Furniture is proud to bring you wonderful temporary and permanent furniture solutions in a variety of categories. With AmTab stages and risers, you get the same quality and durability in a social hall, auditorium or gym. These supportive and appealing performance platforms will help any budding musicians shine. Sturdy tables come in a number of different styles to fit a variety of purposes. 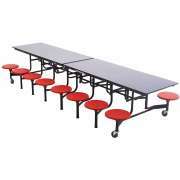 AmTab cafeteria tables are designed with the needs of a busy school eating area in mind. They are available in circular and rectangular configurations with or without attached seating. 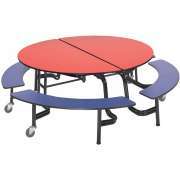 A variety of surface and edge-banding materials enable any school to enjoy these sturdy tables, no matter what their budget is. 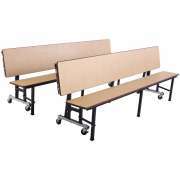 Lunchroom tables come with either stools or benches, so each school can determine which option is better for their student body. They lock in the upright folded position for compact storage. 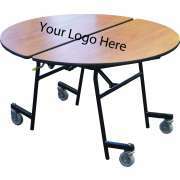 For easy mobility, they roll into position on strong casters, so setting up or rearranging the cafeteria is a breeze. Any venue where banquets or celebrations take place requires some sturdy folding tables. Foldable tables are ideal for temporary use because they are stable when they are set up, yet they can easily be folded up for storage. We have round folding tables and rectangular folding tables in a selection of sizes so every venue can choose the space arrangement that looks the best in a particular space and provides the desired seating capacity. Folding tables are often used as banquet tables. They can be arranged just about anywhere, and offer a great space for formal events. With some elegant tablecloths, napkins and place settings, no one will even know that there is a folding table underneath. Rather than spending many hours carrying heavy furniture into the social hall, you can set up banquet tables in a matter of minutes while achieving a stately appearance that is worthy of an awards dinner or annual holiday party. 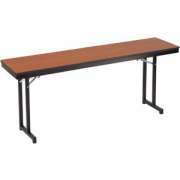 In an office or school setting where there are often training sessions or professional days, it is helpful to have some dependable seminar tables. 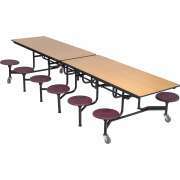 Unlike regular tables, training tables are designed for people to sit on one side so everyone can face the speaker at the front of the room. AmTab seminar tables have cantilever legs which provide maximum legroom. They are available in a huge selection of tabletop colors and sizes, so you can have great temporary workspaces in any room. Whenever you have a significant number of folding tables, you need an easy way to move them around. Table carts are designed for smooth transport requiring a minimum of labor and effort. When choosing table dollies, it is important to make sure that they fit the shapes and sizes of the tables that need to be transported. You can enjoy AmTab quality in your performance spaces as well. AmTab's portable stages are designed for easy arrangement and tough support. They can be setup in a variety of configurations to transform a regular room into an auditorium. 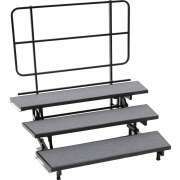 Easy storage makes these stages convenient at all times. To ensure safety, guard rails should be purchased for the sides of the stage that will not be directly against a wall. Whether you have a choir, band or orchestra, you will need an appropriate place for musicians to sit or stand during performances. When everyone is lined up on the stage, it can be difficult to make sure that all members and participants are visible to the audience and conductor. 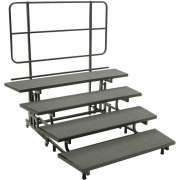 With band risers or choir risers you can ensure that all student musicians are visible to their adoring family members and fans. It is important to determine whether you will be using portable risers for seated or standing musicians because they come in varying widths. Whether you are bringing music into the educational environment or hosting a professional-development seminar, AmTab furniture will serve your institution well. With models that are designed for easy transport and arrangement, you won't have to work too hard to get a space setup. From storage to configuration and beyond, AmTab tables and stages will stay in great shape through many events and occasions.